All workplaces require some form of hygiene service; it’s a matter of health and safety responsibility. 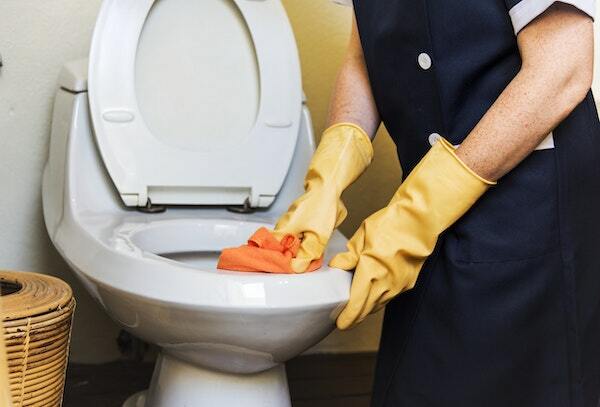 Whilst staff often clean up after themselves, it is essential that your business is regularly and properly cleaned. Unhygienic environments can be detrimental to staff, customers, and productivity, so it is important to think about the type of cleaning your company needs. What does daily contract cleaning consist of? Professional cleaning companies are contracted to make sure that your workspace remains hygienic at all times. They clean your premises as often as you require, with their services customised to match each client’s requirements. Daily contract cleaning often involves tasks such as cleaning of desks, sweeping of floors, bathroom cleaning, emptying of bins, floor vacuuming, and the cleaning of communal areas like staff kitchens. Having a professional standard of cleaning in your workplace is the most effective way of preventing staff illness. You may have an employee with a dust allergy, who would suffer in a dusty workplace that is not appropriately maintained. Also, a hygienic environment is essential in preventing the spread of viruses and illnesses. Unnecessary germs are bad news for employers as well as employees, as your business will suffer if you experience high levels of sick leave. Some companies opt for one cleaner, who may only work part-time, rather than seeking the services of a commercial cleaning company. However, advertising for the role and choosing a suitable candidate takes valuable time and money. Hiring one cleaner also means that you will have to buy professional cleaning equipment, as well as having to regularly refresh cleaning products. Utilising a professional cleaning service is less hassle and less expensive, and means you get experienced and equipped cleaning staff who require far less supervision. How does a clean office affect first impressions? First impressions of a workplace can linger particularly. A clean office is essential to keeping clients, customers, employees, and associates comfortable. By ensuring that everyone who enters your workplace gains the best possible impression of your company, you are helping to secure positive and profitable working relationships. If a potential client is visiting your office for a meeting, you want to create a calm and collected atmosphere. Cleanliness is paramount to achieving this. Even the smallest of details – dusty desks, stained windows, grubby door handles – create an impression of carelessness and chaos. A business associate needs to instantly feel at ease. They should remember your office for its pristine-ness and professionalism, as opposed to being the office that served them water from a smudged glass, slid over to them across a greasy table. Having a professionally cleaned office means that every room; every inch of the workplace is immaculate. Expert cleaners are meticulous, and can focus particularly on facilities most used for business, for example, the reception area, meeting rooms, and bathrooms. New clients and potential customers become aware of that instantly. If your office is maintained to such a high standard, its visitors and employees immediately perceive your company to be detail-orientated and mindful. This speaks volumes about the way business is conducted. A clean office not only makes an impression upon its clients and customers but upon its employees, too. Companies have a responsibility to their employees to provide a clean and well-maintained space for working. As such, it is important to make a good first impression with prospective employees. In an interview situation, for example, a great candidate may decline a role within your company if your office appears unclean – a dirty workplace is not attractive to anyone. You need to prove that you genuinely care about working conditions and the comfort of your employees. Employing a professional cleaning and maintenance service gives a general impression of success. If your company has the need for such thorough maintenance and has the resources to hire such cleaning services, it must be a productive, prosperous, and thriving business, one which its owners and directors invest into. The benefits of creating this impression are endless. At Regional Services, our daily cleaning service is where we are at our strongest. Our cleaning services are specifically tailored to meet your workplace’s daily cleaning needs. We are fully flexible, meaning that we can clean at whatever time you require – you may find that your staff work better without the presence of cleaning staff and opt for an out-of-hours service. Should you wish to employ cleaning staff during the day, we ensure that you see the same cleaners and build long-term relationships with them. « What does a Successful Business Janitorial Service look like?